Für Details zum Produkt "Nio Kangoo Agyo and Ungyo 16,5 cm oxidied" scrollen Sie bitte nach unten. 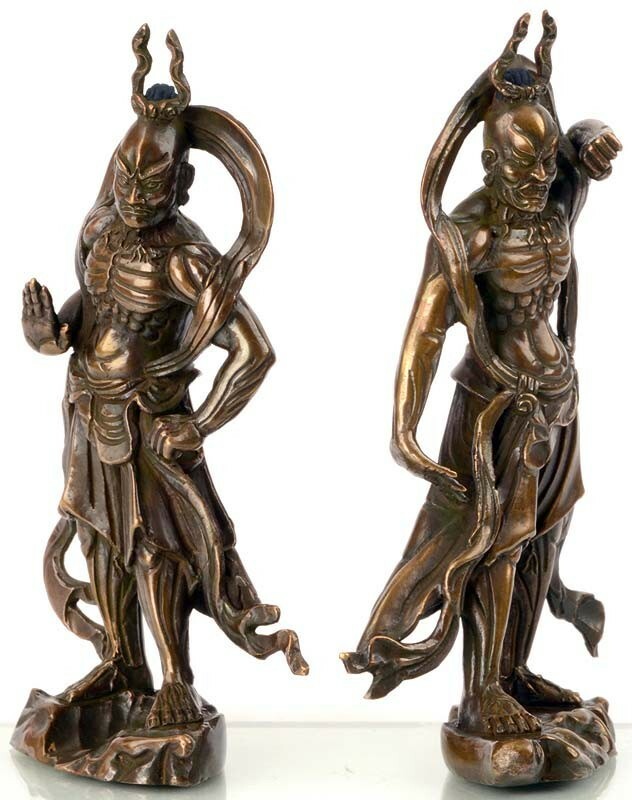 Nio guardians - benevolent kings - Emanations of Vajrapani - represent Alpha & Omega, Beginning & End, Birth & Death. One with mouth open, the other with mouth closed. In Japan, also called Shitsukongō-shin, or Shukongō-shin. The Niō (Jp. 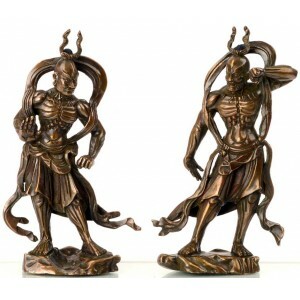 = Benevolent Kings) are a pair of protectors who commonly stand guard outside the temple gate at Japanese Buddhist temples, one on either side of the entrance. 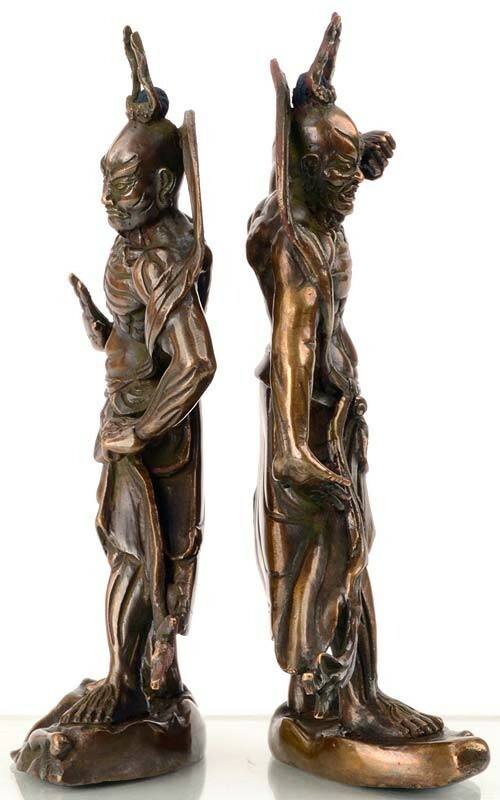 These mythical and magical shrine guardians are commonly depicted with similar iconography: one with mouth open, the other closed. 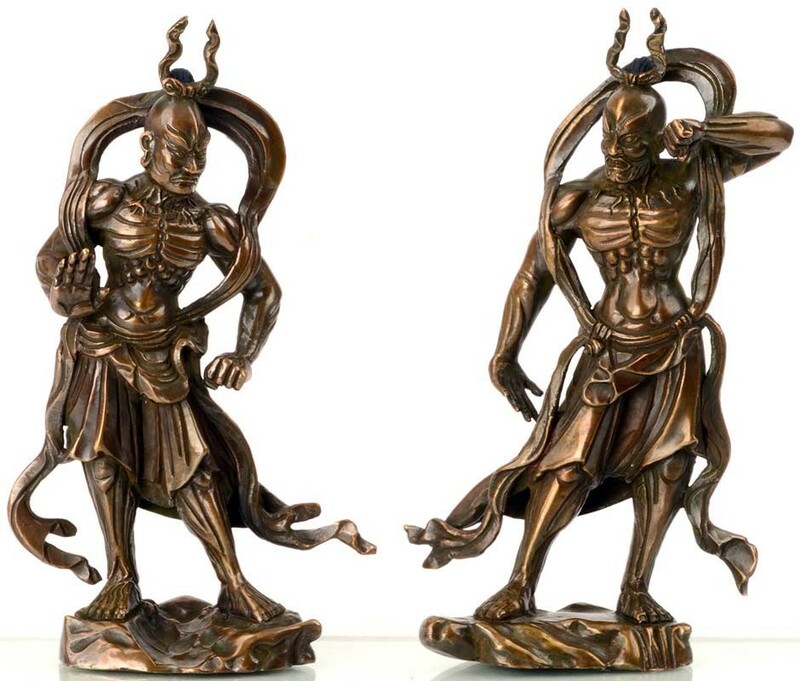 The Niō’s fierce and threatening appearance is said to ward off evil spirits and keep the temple grounds free of demons and thieves. In some accounts, the Niō were said to have followed and protected the historical Buddha when he traveled throughout India. They have since been adopted by the Japanese into the Japanese Buddhist pantheon. Each is named after a particular cosmic sound. The open-mouth figure is called “Agyō,” who is uttering the sound “ah,” meaning birth. His close-mouth partner is called “Ungyō,” who sounds “un” or “om,” meaning death. According to a Japanese story, there once was a king who had two wives. His first wife bore a thousand children who all decided to become monks and follow the Buddha's law. His second wife had only two sons. The youngest was named Non-o and helped his monk brothers with their worship. The eldest, Kongō Rikishi , however, had a much more aggressive personality. 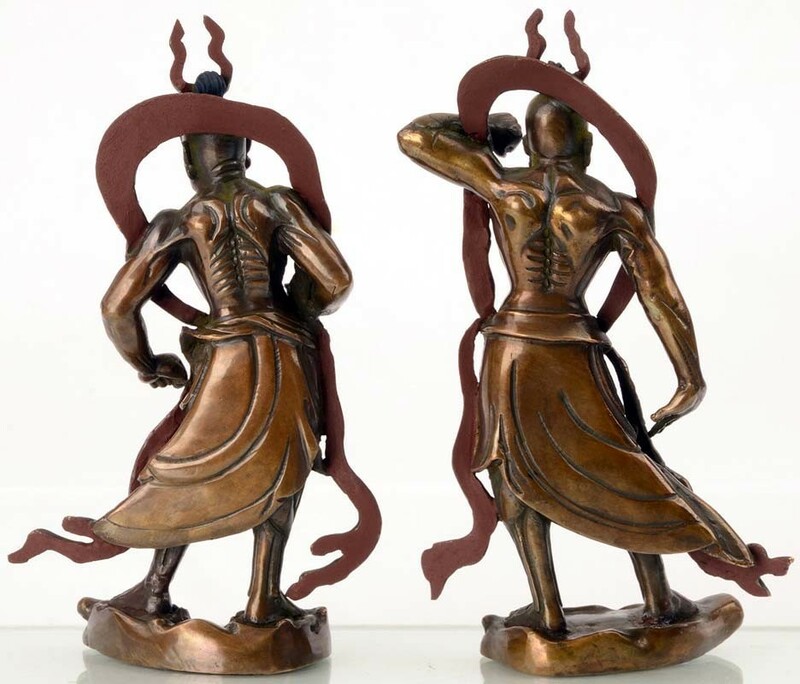 He vowed to protect the Buddha and his worshipers by fighting against evil and ignorance. Kongō Rikishi was the first of the heavenly kings, called Nio Niō (or Kongō). The second is called Shukongōshin . Within the generally pacifist traditions of Buddhism, stories of Niō guardians like Kongōrikishi justified the use of physical force to protect cherished values and beliefs against evil. Statuen werden nur im Set als Paar verkauft.